Welcome to Our Charming Old City Safed (Tzfat) Stone Home! Recently Repainted so our guests will have the feel of a home away from home. Our property was formally an Art Gallery 30 years ago as our guests will first notice the unique architecture that include Safed (Tzfat) Stoned Arches around the windows, room entry, and marble arch in the small bedroom. We are centrally located on ancient and picturesque mountaintop (Old City of Safed (Tzfat - Artist Quarter) that is known as the center of Kabbalah Jewish mysticism, and hosts each summer the annual The International Klezmer Music Festival. Our property is your "Home Sweet Home" with the coziest, most comfortable Bed Rooms in the most remarkable, Ancient Old City of Safed (Tzfat), the City of Mysticism in Northern Israel in the mountains of the Upper Galilee. Our property can comfortable accommodate 5 guests at a time. Our guests will have full access to all rooms and use of the kitchen, bathroom, living area, and Wi-Fi Wireless Internet. Our property features two double beds, single bed, two dinning tables, Shabbat warmer, kettle, urn for hot water, refrigerator, stove, plates, flatware, and plenty of comfort. 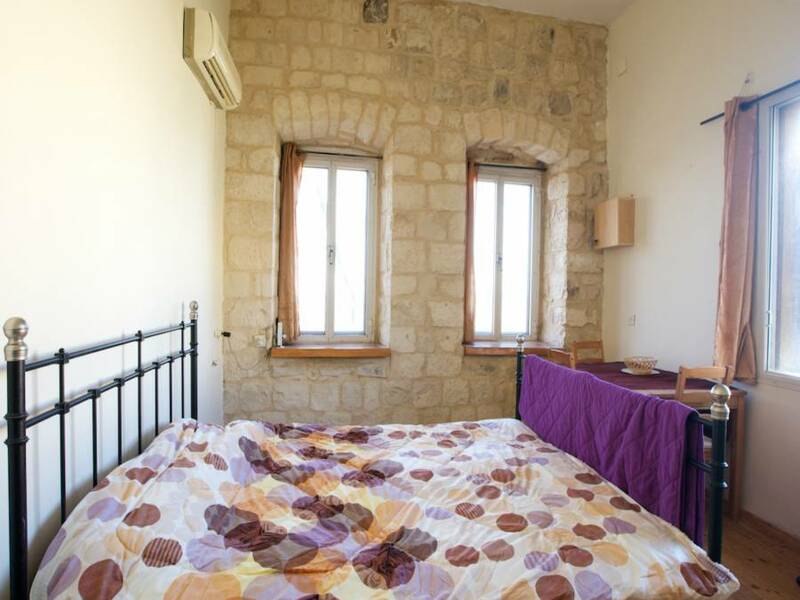 Small Bedroom – Our Small Bedroom features the comfort of one double bed with a feel of living inside an Artist sleeping quarters in the Old City of Safed (Tzfat). Each room is professional cleaned before every guest arrival at no extra charge to our guests. We don’t charge a cleaning fee relative to other properties in the Old City of Safed (Tzfat). Our Property is centrally located in the Old City of Safed (Tzfat) in the Artist Quarter and only a stone throw away from major shops, cafe's, restaurants on the main street, and most ancient sites. We are within a minutes walk from the Safed (Tzfat) Central Bus Station. There are not many homes left that are right in the heart of the mountain which makes this home very unique at the foot steps of the Art Galleries, Ancient Religious Sites, Museums, and Various Restaurants, and Supermarkets. We are within a minutes walk from the Safed (Tzfat) Central Bus Station that offers transportation through out Safed (Tzfat) and Northern Israel. Taxi Services are offered as well. All buses leave from the Safed (Tzfat) Central Bus station that can get our guests to most major cities within Israel. Safed is also easy accessible by major highways throughout Central and Northern Israel. Our rental is most suitable for one couple, families, singles, group of friends, or anyone who is looking for a weekend getaway. Our property is professional cleaned before every guest arrival. We include a special service where every guest will be personally greeted upon arrival in Safed (Tzfat). 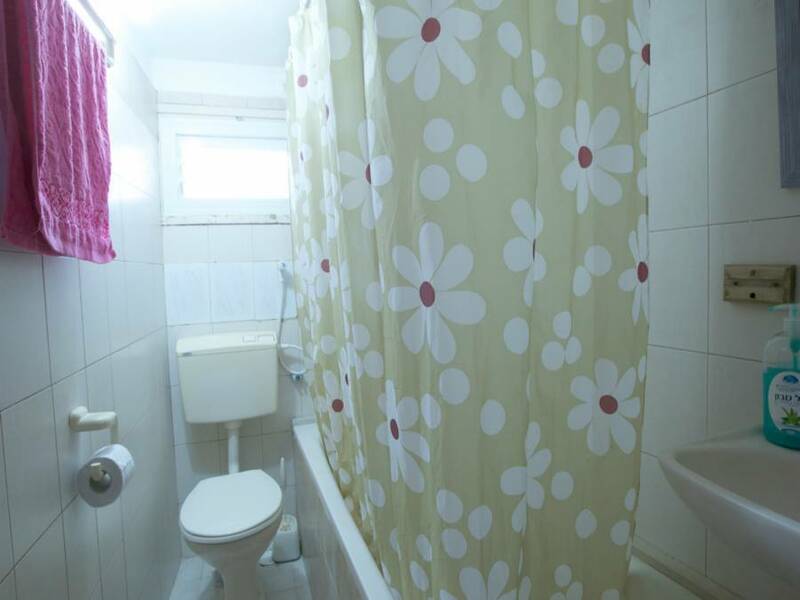 What we charge for the entire house, is what most places in the Old City Charge for a very small room. Having the entire house to our guests offers them security, privacy, and comfort. We are friendly and very happy to assist our guests with any questions and are knowledgeable of things to see and do in Safed (Tzfat) and in the Golan, Galilee area. We speak both English and Hebrew. All Buses generally go from the bus station, its no problem getting around. Be prepared for some uphill walking though remember you are on a mountain! There is both free and paid parking in front of the Art Galleries on Arlozorov St and throughout the Artist Quarter in the Old City of Safed (Tzfat). Guests arriving Saturday evenings or immediately following a holiday should contact us 72 hours in advance for more details of our check-in procedure. Guest will have access to all rooms and use of kitchen, bathroom, and living areas. Free wireless internet will be provided to all of our guests. 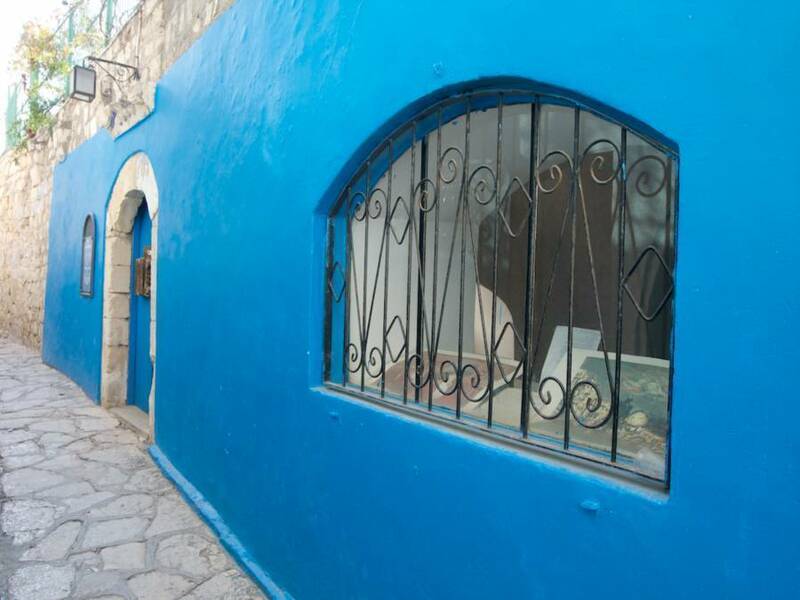 Our Guest House is located within the Artist Quarter - Old City Safed and is centrally located. People are very friendly, helpful, and most speak English. There are many historic synagogues and the history of Safed. The Old City of Safed has two supermarkets that are within 7-10 minutes, two banks within 2-5 min walks, and many places to eat 2-5 min, art gallery 3 min, medical clinic 3 min, central bus station 10 min, and many synagogues 3-10 min depending on which one you choose. Our property can comfortable accommodate 7 guests at a time. Our guests will have full access to all rooms, balcony, full use of the kitchen, bathroom, living area, and Wi-Fi Wireless Internet. If you need any info about Safed and things to do. Just ask! Safed is safe to walk at night where crime is almost non-existent. Lots of things to choose from and many people to interact with. There are three wineries to visit within the Old City - Safed. This is something not to be missed. There is a Cheese factory as well. There are many historic synagogues and the history of Safed. If you are hungry there are several places to eat that is within walking distance such as Pizza Da Leone, Yemenite Lachunch, Sushi with Simcha, 7 Grains Bakery , Tree of Life, The Art Cafe, Falafel California, Mendi's, and much more. There is also a Citadel Park overlooking Safed on top of the hill. Safed offers one mini markets and two supermarkets that are within 2-10 minutes, two banks within 2-5 min walks, and many places to eat 2-5 min, art gallery 3 min, medical clinic 3 min, central bus station 10 min, and many synagogues 3-10 min depending on which one you choose. We highly recommend a trip to the Yashfe Winery (all natural wines with no additives) 5 min, and the Citadel 10-15 min. $13 for each additional adult or $10 for each addiltional children after the first person. 10% off between Nov 1 and March 31 Except Holidays. 1. Check-in times are between 14:00-21:00 unless prior arrangements are made in advance. 2. Check-out between 11:30-12:00 PM. 4. Shabbat check-in is no later then 2 hours before sundown and Check-out is no later than 1 hour after Shabbat. Cleaning of the entire apartment on the 1st and 4th day including change of bed linen and towels. If necessary, 10:00-21:00 at your disposal the property management of the property by phone. 5. All children or additional adults are charged between $10-$13 per night. 6. If the booking is cancelled by the guest a minimum of 5 days before check-in (12 noon, local time) the amount refunded will be 100% of the booking amount minus any service fees. If the booking is cancelled within 5 days of the check-in date there will be no refund issued. 32. Then, park anywhere along the Art Galleries on Arlozorov St.
33. Then walk on Arlozorov Street until you reach a small brown wooden house on your right, then turn right and keep walking until you see two black metal gates on your left. 34. Head up a few steps where you will see a big brown door on your right, then go through the door, our property is the first door on your right next to the black metal stair case. Bus: Best way to get here from the center is take buses 846 from Tel-Aviv or Bne Barak Buses 980, 981, or 984. You can also take the 845 bus from Tel-Aviv to Rosh Pina. Then take the 511 or 522 bus or a Taxi. Train & Bus: Take the Train to Akko from Tel Aviv Center, and Haifa, then cross the street and take the 361 bus to Tzfat.